But let me be honest; they do still have some way to go if they want to live up to their own goals. 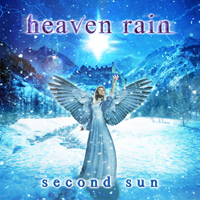 "Second Sun" is their second full-length album, first one "Far and Forever" was released in 2008, and they have also released 4 singles and 2 EPs during their six years of existence. Their take on progressive metal has influences from hard rock, power metal as well as symphonic metal, and the first band I thought of when I listened to this album was Within Temptation. Everything is well played, the production is fine and vocalist Miona Graorac has a strong voice, but they do lack a lot in originality. The nine songs, along with an intro and a cover version of a 80s Yugoslavian classic original done by Zana show a band with a clear vision of the direction of the sound. But they need to step out of the box to take their music any further than this.